If you run a business, you know that traditional advertising is over. To succeed in the world of online marketing, most businesses are advised to start creating content. Content, such as text, videos, articles, and photos act as “bait” to get potential customers engaged with your company. 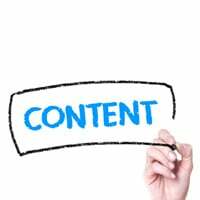 Content is the fodder of social media, search engine optimization and email marketing. However, it is not easy to create enough content at sufficient frequency and quality. Creating a good content plan simplifies the process and helps you release quality content over time. Content is very good for generating leads. For example, most Search Engine Optimization (SEO) experts recommend having an active blog on your website. This helps bring in site visitors from the search engines. If you set it up correctly, you should get more leads from a blog. Also, propagating your quality content on social media makes your company interesting to potential leads, helping to draw them in. The key to marketing with content is to educate readers. This is not a direct sales pitch. You provide valuable information to your market, and in return, they learn something about your business. They may become a bona-fide lead and eventually, a customer. When you start making your content plan, think about what your customers are interested in. If you are answering their questions and telling them material they want to know, you will become associated with expert knowledge. This gives your company exposure to your market and increases the chance they will engage with you. Content helps retain existing customers. Send out emails to customers that include your latest content or link to your newest blog posts. This shows customers that your company provides advice and expert knowledge about their interest. It helps reduce the chances they will wander off to other sources because your content is right there in front of them. Over time, your excellent and timely content helps make customers more loyal because they trust you. They know your content is well-researched, well-written and reliable. This typically means more sales. Your true raving fans will share your content with their friends, building a bigger network. Basically, you want to be seen as a company that people can depend on for expert information. The Internet is an ocean of questionable knowledge; your company can be seen as a solid anchor if you write reliable content. Making content will make your company more visible. The content life cycle usually begins on your website or blog. Articles your company produces there help draw in traffic. Recycle this information on Facebook, Twitter, Instagram, LinkedIn, Google Plus and Pinterest if relevant. Then look into adding new videos on YouTube that answer questions and solve consumers’ problems. The more, the better. Decide how often you need to publish on each “channel” (blog, social media, email, etc.). Plan out a calendar for several months. Hold a meeting with employees who have direct contact with customers. Write down the questions that leads and customers are asking about your topic area. Write down topic areas in your field. Brainstorm topic ideas. Choose relevant topics and put them into the calendar. Remember that certain holidays, company sales and events can be tied in to the topics. From this calendar, create a production schedule and delegate content creation. Planning out your content makes everyone’s job easier. Rather than rushing to put content out the door in gushes, space your content over time. You won’t miss out on valuable tie-ins with holidays, special sales events, and seasonal changes. Your webmaster and social media team can run reports that show how your content plan is working. Look forward to seeing an uptick in leads, sales and customer retention over time.